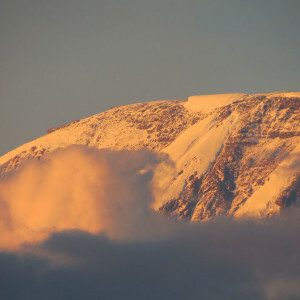 Our guided Kilimanjaro trek is a wonderful trip for climbers of all abilities. Africa offers such diverse options for travel, but climbing to its pinnacle is our personal favorite way to experience the continent. We cut no corners to help you have a the experience of a lifetime as you revel in the rich culture, spectacular views and encounters with local wildlife while we take care of the details. Enjoy the Kilimanjaro climb with the leadership of our highly trained Mountain Trip guides and additional support from local porters. 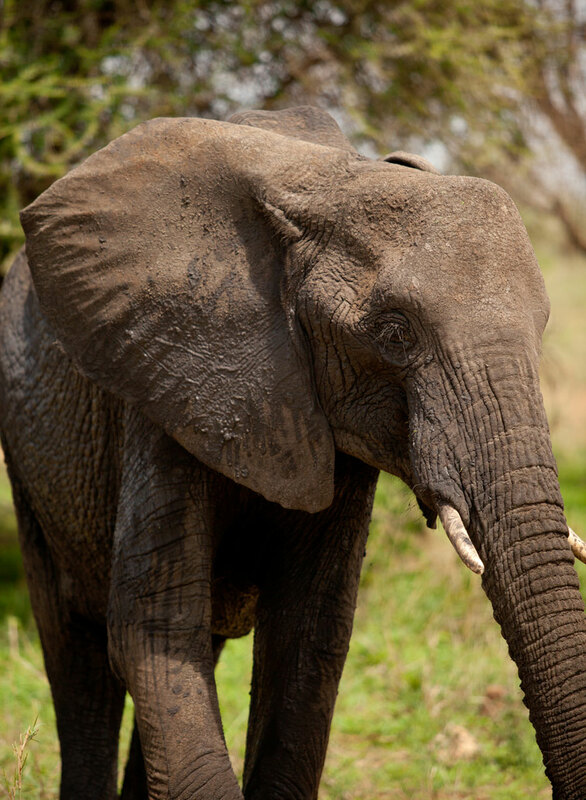 Add a safari to your trip to round out your experience and see some of Africa’s most majestic and unique animals up close. Our Kilimanjaro trek ascends the Machame Route, which approaches Kilimanjaro through the forest and moorlands from the southwest side of the mountain. The rainforest is beautiful and there is a tangible sense of wilderness once we reach higher elevations. The views of neighboring Mount Meru floating on the clouds are simply unforgettable. 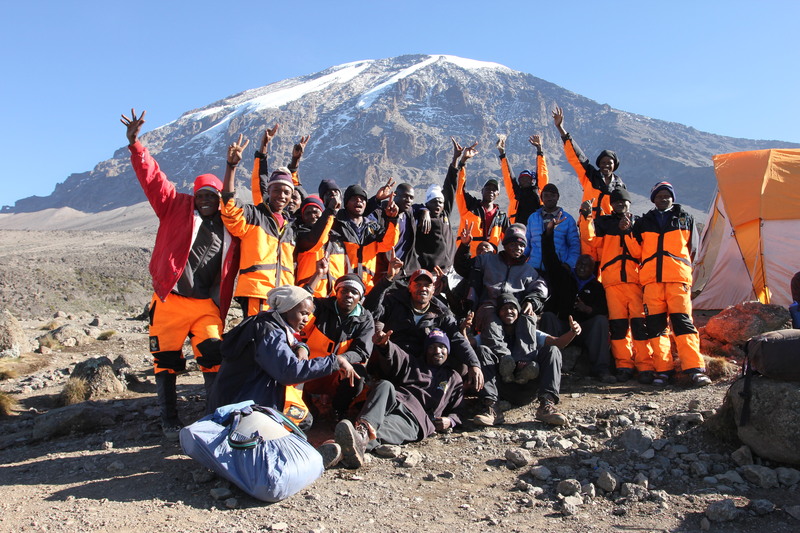 We make our final ascent by the Barafu route, departing for the summit from the camp for which the route is named. We are happy to add a safari to any Kilimanjaro trek! Anything from a 3 to 9 day Safari including Tarangire National Park, the N’Gorongoro Crate, Lake Manyara National Park, and the Serengeti. 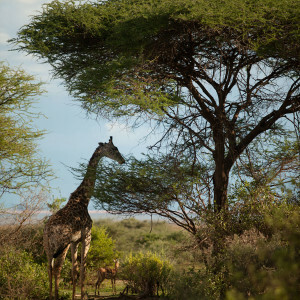 Inquire for details about an add-on custom luxury Safari. 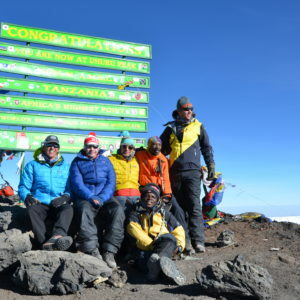 Mountain Trip offers a seven day Kilimanjaro trek itinerary, designed to allow climbers a bit more time time to acclimatize, which makes the summit push safer and much more enjoyable and also gives us plenty of time to revel in the magnificent scenery of Africa. You’ll find shorter trips offered by other outfitters, but we firmly believe that building a base of acclimatization makes for a much better experience. 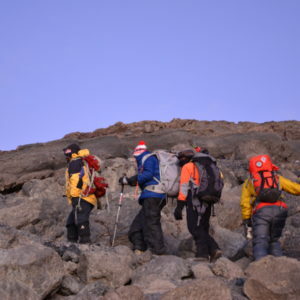 There are many, many options for how to climb Kilimanjaro and you should base your choice of guides based on what you are hoping to get out of your Kilimanjaro trek and your trip to Africa. 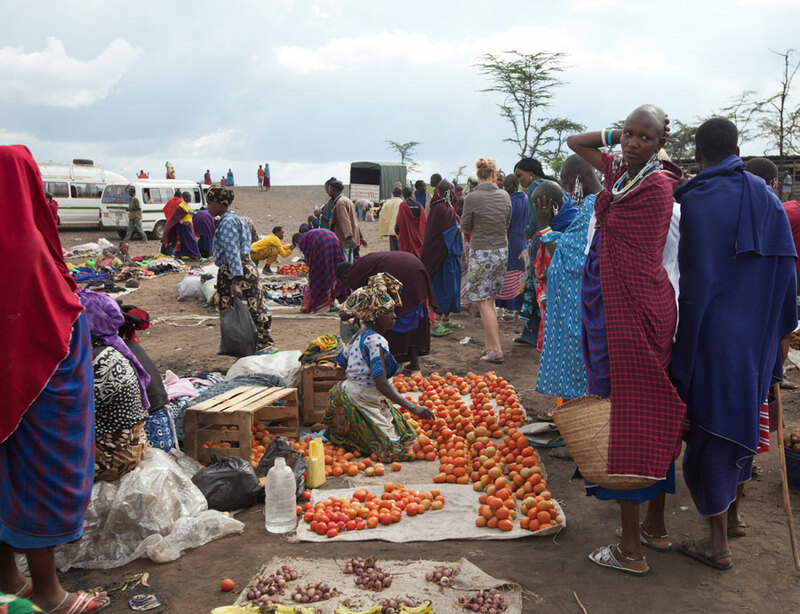 We want to help you make the most of your time in Africa, from the moment you land at the Kilimanjaro International Airport we’ll hop in a Land Cruiser and head out to the wilderness instead of staying in a hotel in the cities of Moshi or Arusha. We enjoy a luxury Safari style tent lodge where we can watch wildlife from the breakfast table and go on a guided walk in the bush. Shorter, 5-day ascents are common and often cost less. The trade off is that you should expect to feel pretty badly on summit day, as four days on the mountain is just not sufficient time in which to acclimatize to almost 6000m. 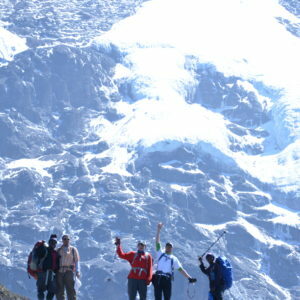 Mountain Trip has worked to earn a reputation of providing very high quality experiences around the globe. 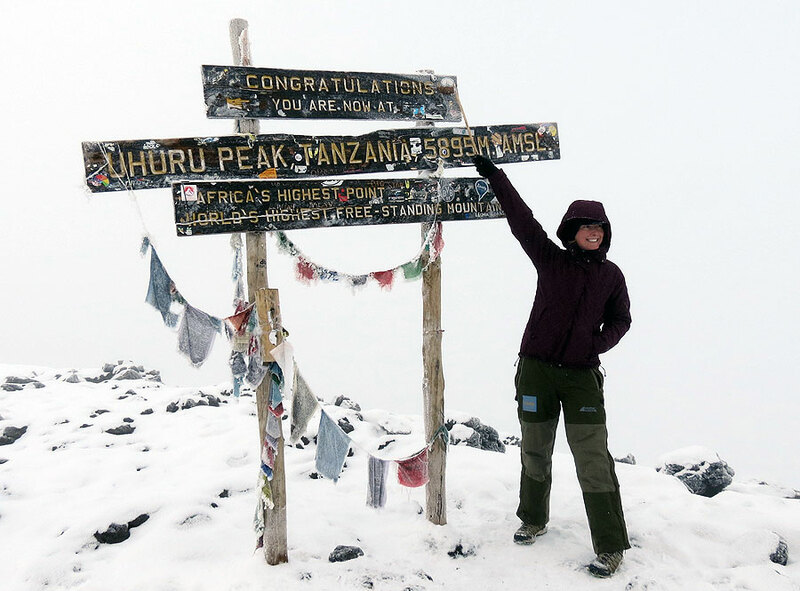 We bring that commitment to quality to our Kilimanjaro trek as well. 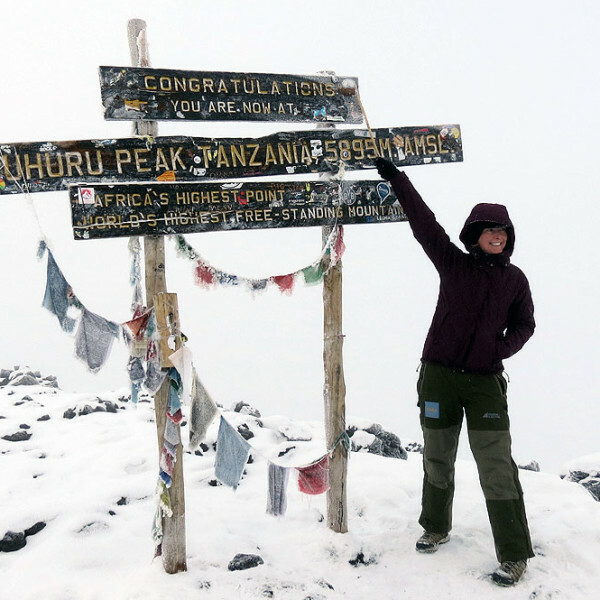 You’ll notice that we stay in extremely nice lodges and our Kilimanjaro treks are staffed with both local guides, as well as our Mountain Trip trained staff from the US. 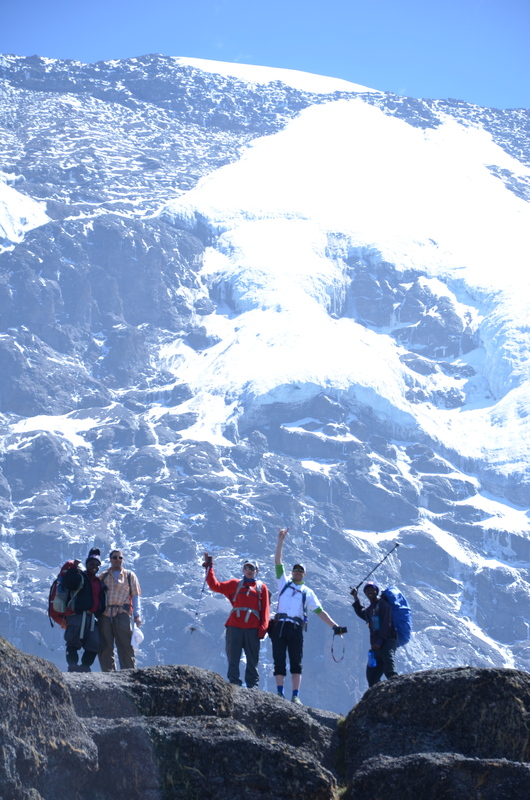 We feel the benefits of having our guides providing the high level of client care, security and knowledge of altitude medicine for which Mountain Trip is renowned is well worth the expense of staffing our treks with our US guides. 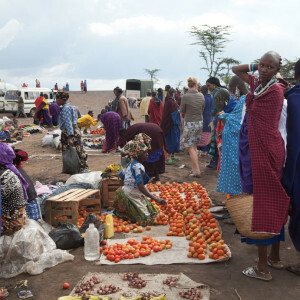 Arrive in Tanzania. Generally it is preferable to fly directly into the Kilimanjaro International Airport (JRO) where we will meet our team and driver. Often these flights come in late in the evening and we’ll go directly to the beautiful N’darakwai Lodge for the night. Instead of staying at a somewhat generic hotel in the cities of Moshi or Arusha, we’ll take you to a beautiful and luxurious Safari style tent lodge where you’ll see wildlife from your breakfast table. Make the most of your time in Africa! Day 2: Kilimanjaro Trek Preparation and Wildlife Viewing! We’ll have this day to prepare our gear, unwind a bit, and enjoy the grounds of the N’darakwai Lodge. 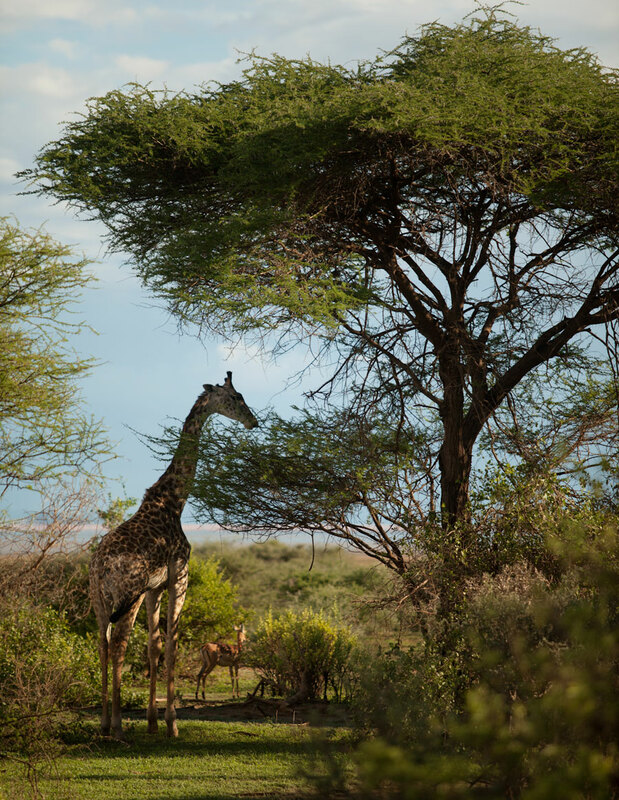 We can take a short walking “safari” through their wildlife preserve and see our first African wildlife! We will meet our local guides, do a final gear check and have a pre-trip briefing on this day. 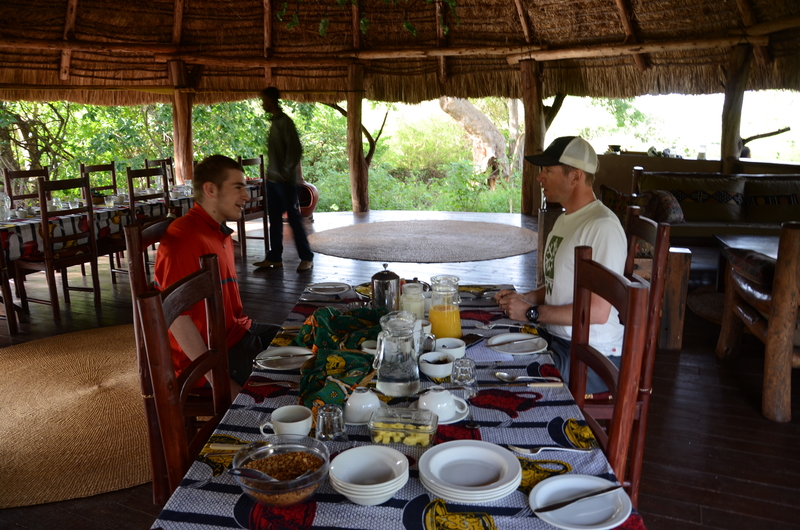 We’ll wake up early and have breakfast at the Lodge before loading up into our Land Cruisers to drive to the trailhead. 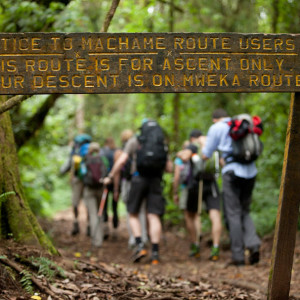 The Machame route starts at the Machame Gate Park Entrance (1800m/5900 ft). After a short walk through the banana and coffee farms of Machame village, the path follows a ridge through dense tropical mountain forest. The gradient becomes gentler as the forest slowly merges into giant heather close to our camp near the ruins of the Machame Hut (3000m/9850 ft). After coffee and breakfast, we’ll get off to an early start on this day and trek higher above the last of the rainforest and into the fields of heather as the views open up. We’ll enjoy views of the Kibo peak and the jagged rim of the Shira Plateau. We’ll see some of the famously beautiful plant life of Kilimanjaro passing the first lobelia, protea and giant Senecio on our way to our camp near the Shira Hut. From this camp we enjoy some of the most spectactular views on Kilimajaro and can see across to Mt. Meru floating in the clouds. behind to walk on lava ridges beneath the Western breach to the Lava Tower (15,090ft/4,600m) After lunch near the Lava Tower junction, we descend into the Barranco valley past the giant Senecio plants to our campsite, sheltered by towering cliffs and with extensive views of the plains far below. One of the most stunning days of the trip, we begin this day starts with a steep climb up the Barranco Wall. We continue around the southeastern flank of Kibo, with vistas of the Southern Ice fields to our camp at Karanga. There is plenty of time to rest, or for a short optional acclimatization walk in the afternoon up the valley above the camp. 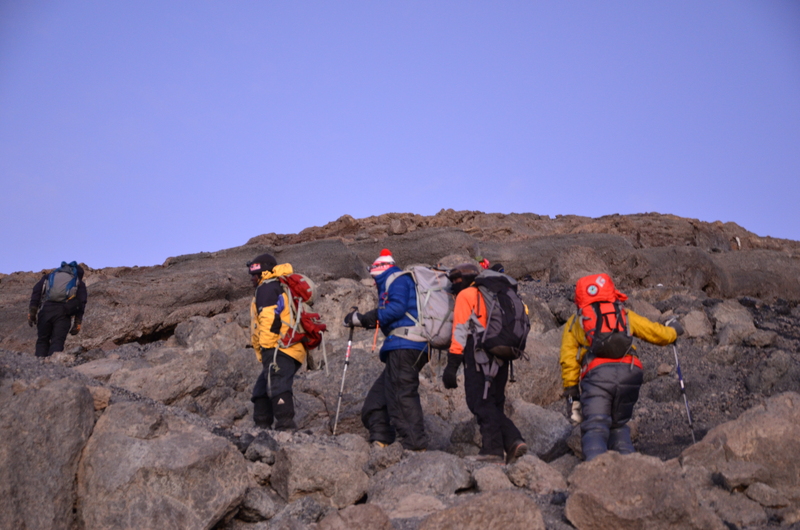 The air gets thin at this altitude and we’ll start slowing our pace as we climb up to the rocky Barafu Camp. 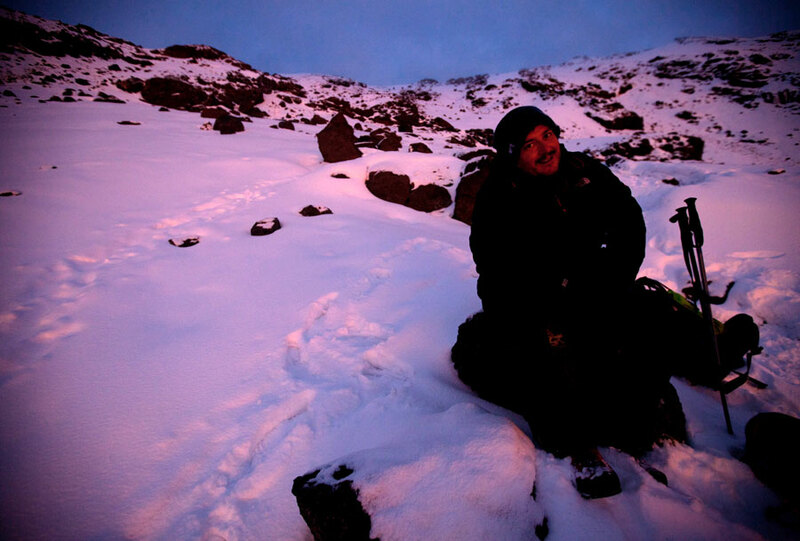 “Barafu” means, “ice” in Swahili, and you’ll feel the temperatures drop as we get higher on the mountain. This is a relatively short day, but we’ll be trying to get some rest as we prepare for our summit climb tonight. Day 8: Kilimanjaro Trek Summit Day! We will start our ascent of Kilimanjaro by headlamp shortly after midnight so that we can be up on the Crater rim by sunrise. The steep climb over loose volcanic scree has some well graded switchbacks, and a slow but steady pace will take us to Stella Point (5,735m), in about six hours. We will rest there for a short time to enjoy the sunrise over Mawenzi before continuing the 1-2 hour roundtrip along the crater rim to the high point of Uhuru Peak. 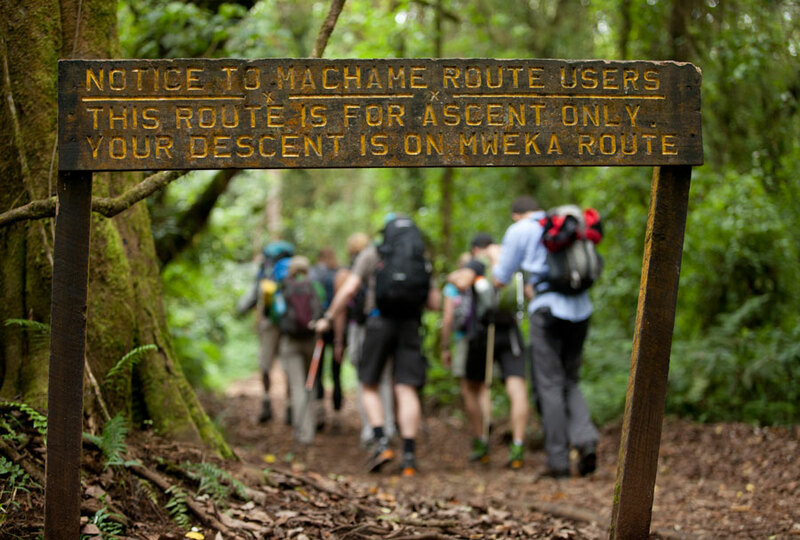 The descent to back down to the Barafu Camp goes much faster, and after some rest and refreshment, we will continue to descend to reach our final campsite at the edge of Mweka Forest. A sustained descent through lovely forest with lush undergrowth takes us to the National Park gate at Mweka and on through coffee and banana plantations to Mweka village. [3-4 hours walking]. There we will be met by our vehicles to take us back to the beautiful Arusha Coffee Lodge for a well-earned shower and delicious meal. At this point some may be heading back home, or if you are continuing for a Safari option, or the Mount Kenya Climb we will start those itineraries on this day. 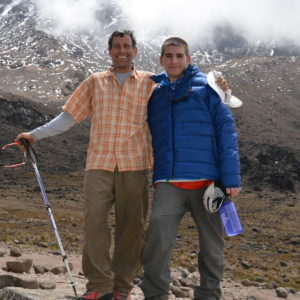 The following is a general list of required gear for joining Mountain Trip on a trek up Kilimanjaro. Many of the items on the list need to fit you well in order for you to fully enjoy your experience on the mountain. Please plan ahead with equipment purchased for your trip so you can be certain that your gear fits you well. Tanzania is not the place to discover that your pack is too small for your torso, or that your boots give you blisters, as we will not have many options open to us at that point. Recommended items reflect the opinions of our guides. We have used and have faith in all of our recommendations, but they may not necessarily fit or work for you. Call or email us with any gear questions. 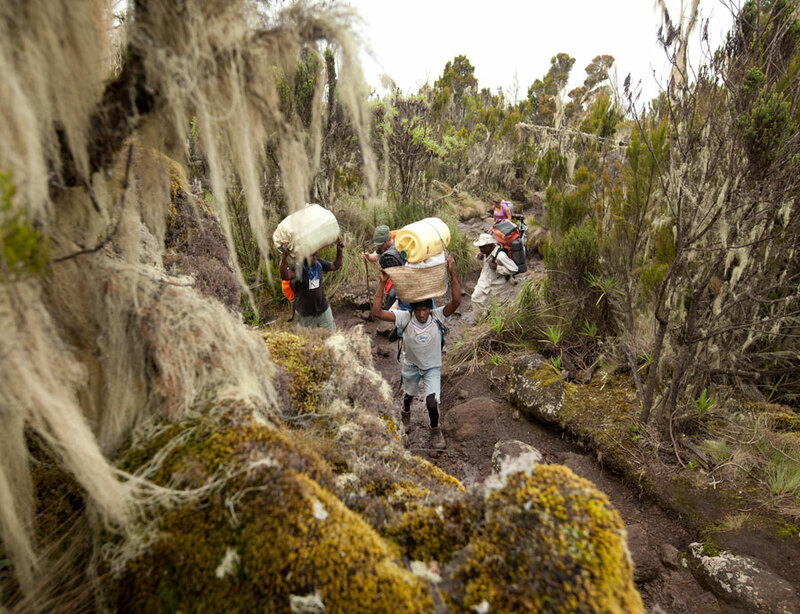 We want you to be as prepared as possible for your Kilimanjaro trek. Please follow this list closely and do not hesitate to call us for clarifications or to solicit an opinion about anything you are considering. Lastly, only bring quality gear that is in very good condition on your trek. Hiking Boot for Kilimanjaro The climb will take us from potential rain and mud down low, to colder temps and even snow on the summit day. You should choose a boot that comfortable to hike in, and is waterproof (goretex lined). This doesn't need to be a big mountain climbing boot, but should be a good backpacking type waterproof boot. Light Camp/Travel Shoe A lightweight running shoe or athletic shoe for camp, safari, and travel. This does not need to be waterproof. Travel/Trekking Shirts Bring a couple of light, long sleeved travel shirts. Synthetic shirts are nice for trekking and help keep the sun off on Safari! Shorts for Trekking/Travel A comfortable pair of shorts for trekking and traveling. Lightweight Gloves for Kilimanjaro A pair of lightweight "trekking" gloves for the cool early mornings on the trek. Mid-Weight Glove for Kilimanjaro An insulated glove for when it get's colder and we are getting higher on the mountain. Summit Day Glove/Mitten Kilimanjaro A warm, insulated waterproof (gore-tex) glove or mitten is good insurance against cold hands on summit day. Pack Rain Cover A waterproof jacket for your backpack. Water Purification System There are many good options, and they get better every year. Pumps work well, but can be heavy. Our favorite is the relatively easy to use and lightweight water treatment drops by Aquamira. The SteriPen style water treatment is not recommended. Be certain to have enough to treat 3-5 liters per day for the duration of your trip. Snacks Think about bringing 10 of your favorite energy bars, or candy bars, and some energy drink. These are optional, but it's nice to have some of your favorites that are not available elsewhere. Don't over do it as this stuff gets heavy and we will provide plenty of food. [post_excerpt] => Bring a couple of light, long sleeved travel shirts. Synthetic shirts are nice for trekking and help keep the sun off on Safari! [post_excerpt] => A comfortable pair of shorts for trekking and traveling. [post_excerpt] => A waterproof jacket for your backpack. [post_excerpt] => There are many good options, and they get better every year. Pumps work well, but can be heavy. Our favorite is the relatively easy to use and lightweight water treatment drops by Aquamira. The SteriPen style water treatment is not recommended. Be certain to have enough to treat 3-5 liters per day for the duration of your trip. [post_excerpt] => Think about bringing 10 of your favorite energy bars, or candy bars, and some energy drink. These are optional, but it's nice to have some of your favorites that are not available elsewhere. Don't over do it as this stuff gets heavy and we will provide plenty of food. 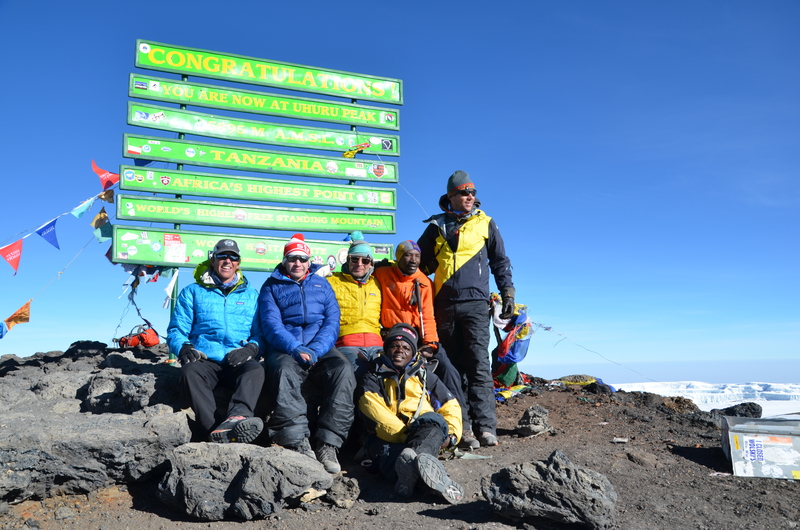 • All Kilimanjaro treks require a $1,500 deposit to secure a spot on the team. Your submission of a deposit constitutes your acceptance of this Fee Schedule, Refund and Cancellation Policy. 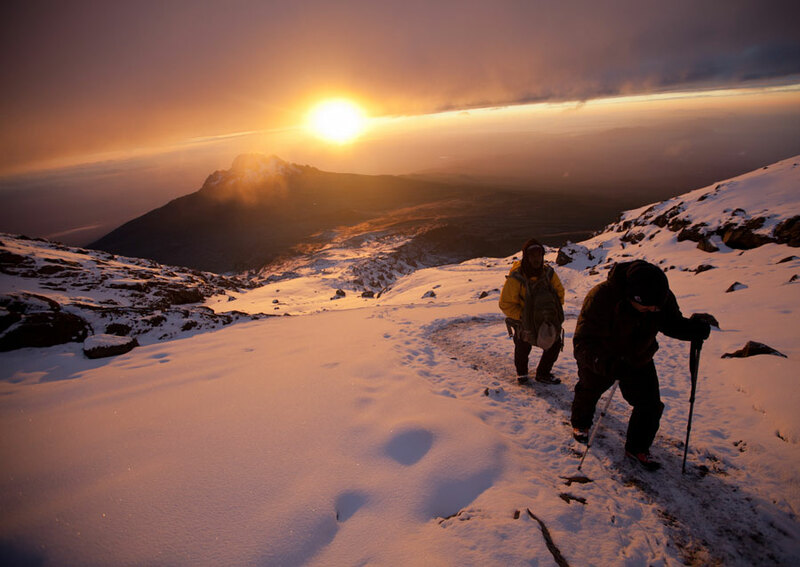 • All deposits for Kilimanjaro treks include a non-refundable $750 administration fee. • Final payments for the Kilimanjaro trek must be received 120 days prior to the Team Meeting Day in Tanzania. • No refunds will be provided for cancellations occurring within the last 89 days prior to the trip meeting date. 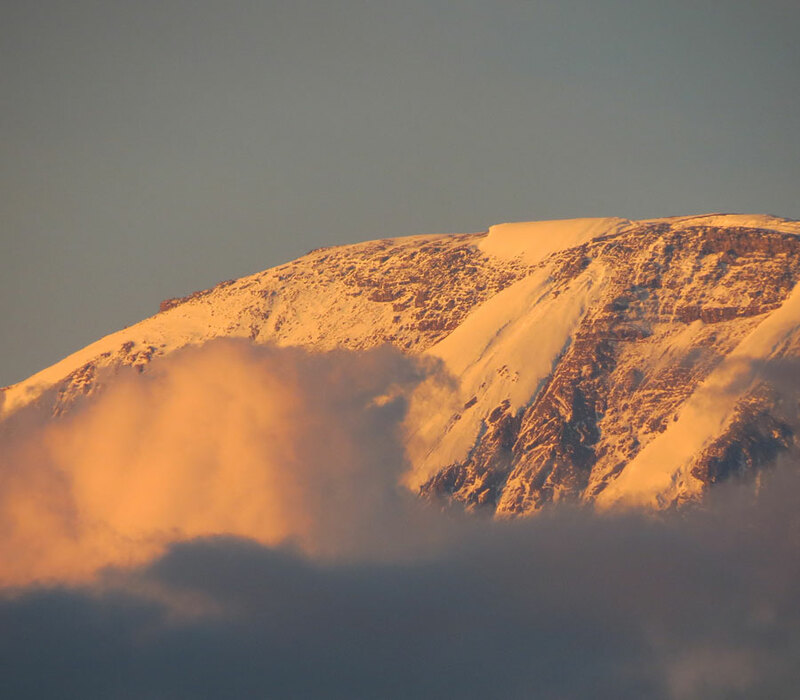 • If you register for a Kilimanjaro trek within 90 days of the Team Meeting Day, expedition fees will be due in full to secure your spot on the team. 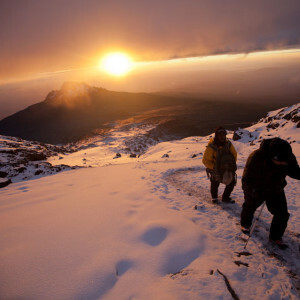 • Mountain Trip reserves the right to cancel a Kilimanjaro trek prior to the departure date for any reason. In such an event, all monies collected by Mountain Trip from team members for that expedition shall be promptly refunded. This is the extent of our financial liability. • Lodging as included in the itinerary. We may not be able to guarantee a specific hotel, but will always attempt to substitute with equal accomodations. When registering for a Kilimanjaro trek with Mountain Trip we want to help make sure you understand the services we are providing and the services you are responsible for. 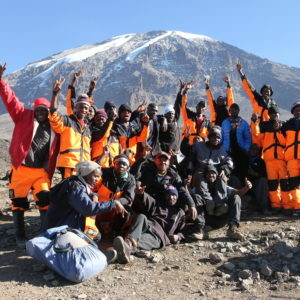 The main purpose of becoming a team member is to join us on a guided Kilimanjaro trek. As such any transportation we provide or that you may contract for on your own is incidental to the trip. We suggest that you make sure you have time built into your itinerary for delays. 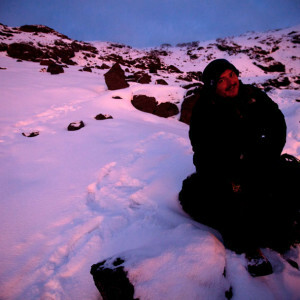 We will designate a specific Team Meeting Day for your Kilimanjaro trek. Transportation to the meeting point on your Team Meeting Day is to be provided by you. You must arrive in time to be ready to participate in a team meeting at the appointed time on the Team Meeting Day for your expedition. This probably means you will need to arrive the day before, as our Team Meetings for Alaska trips are held in the morning. Expedition climbing is very dynamic and we will provide you with a recommendation as to when you should book your flights to and from your destination. We suggest you book a ticket that allows you to change your flight with little effort or cost. 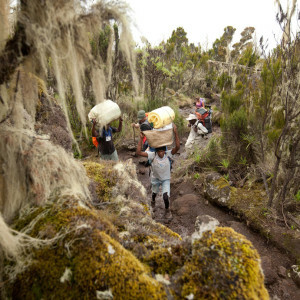 While on the Kilimanjaro trek, team members are responsible to maintain basic levels of hygiene and to conduct themselves respectfully with other team members and members of the local population. If a guide feels that a team member is putting other members’ health or safety at risk, the guide has the discretion to remove a team member from a trip. Use our office staff and your lead guide as pre-trip resources to ensure that all your questions are answered. 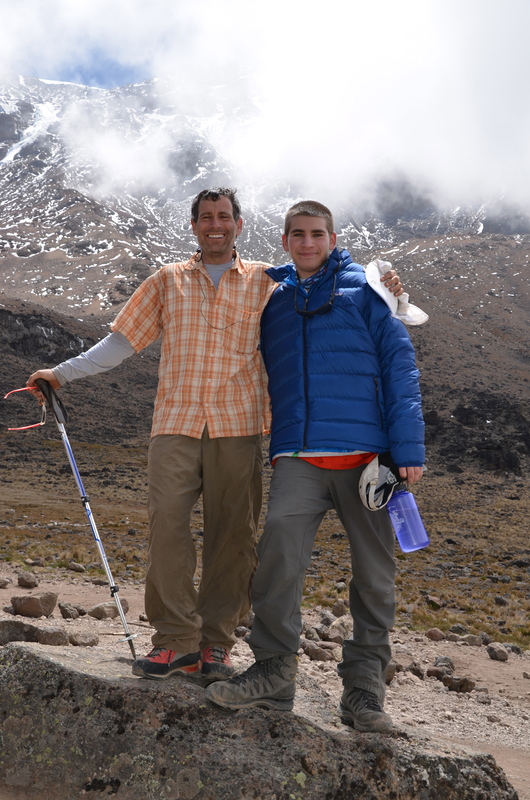 Travel insurance may help recoup expenses if you need to leave your Kilimanjaro trek due to an illness. 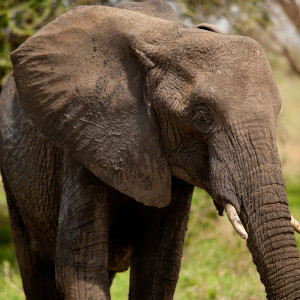 Add a 4 day luxury Safari to any departure! Custom and Private trips available! Please inquire for family trips or luxury adventures.